Originating from a fascinatingly diverse region of the world, Caucasian and Russian rugs clearly reflect the multicultural background from which they developed. Distinguishable by dynamically depicted hexagons, diamonds, small crosses and other geometric shapes, rugs included in Esmaili’s antique Russian rugs collection online tell wonderful stories about village life by depicting animals and humans within a rug’s interior design. Offering animated infusions of natural colorings, unique designs and fluid movements, our antique Russian rugs will bring an immediate, exciting sense of life and depth to stagnant, overly detached rooms. Well-preserved and hand-woven by the finest Russian rug weavers, pre-18 th century Russian rugs are among the most popular rugs we have in our impressive online Russian rugs collection. 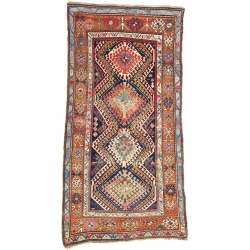 Brilliantly colored antique Kazakh rugs from the Caucasus feature iconic symbols that include geometrically-shaped people and animals, expressive medallions, notched or indented fence borders and oblique cloudbands. Variations of a symbolized ram’s horn are also seen frequently in Kazakh rugs — as a single horn, double horn, broken or cross-shaped horn. 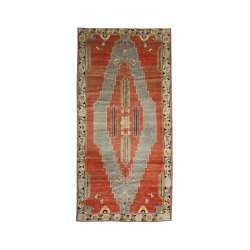 Kazak rugs continue to be among the most appealing and prized of the Caucasian rugs. High-end interior designers, rug collectors and art museums acquire them for their ruggedly cultural and historical authenticity. However, our antique Russian rugs collection, including Kazak and Uzbek rugs, also make perfect accents for any contemporary setting. While some Kazaks may have stunning all-over patterns, they are most renowned for their striking medallion compositions, thick pile and original knotting. In addition, Russian carpet symbols, motifs and design particulars typically represent superstitious beliefs involving good luck, good fortunes for households and protection against evil spirits. We also have Shirvan, Soumak, Karagagh, Kurd, Bessarabian, Beshir and many other types of Russian rugs in our vintage Russian rug collection. 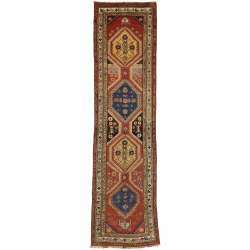 Soumak weaving is an original kind of antique weaving style that comes from the Caucasus. Soumak rugs display a fabulous constellation of designs characterized by precise, crisply drawn patterns, and they typically present highly stylized, somewhat abstract geometric shapes using a rich palette of natural hues. 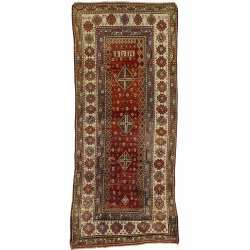 The Soumak rugs included in our Russian rugs collection online are flat-woven rugs implicating a weaving technique similar to Kilims but are more complex and durable as floor decorations. In contrast to the Kilim style of weaving, which consists of tight weft facing running under and over vertical wraps, Soumak rug weaving techniques involves running yarns around warps in serpentine fashion. Caucasian Soumak rugs also provide an array of interesting designs utilizing oversized, polygonal medallions usually shaped like stars or diamonds. These rugs resemble antique Turkish pile rugs and carpets of the large pattern or small pattern Holbein created in Western Turkey between the 15 th and 16 th centuries. One of the key features of Holbein designs includes small squares with hooked, horn-like pairs filling in notches along a medallion’s edge. If you find a particular antique Russian rug that captures your interest, call Esmaili Rugs and Antiques at 214-651-7847 or contact us online to learn how you can add it to your space.